Computer messenger bag for busy individuals on the go to work or school. Multi functional pockets Available with silk-screen or embroidery. 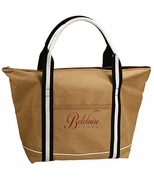 Embroidered logo company bags are always appreciated, showing loyalty to a business or organization.